So far, it is safe to say that this World Cup has been one of the greatest in terms of entertainment. We've had it all: stunning goals, red cards, own goals, VAR controversy, surprise upsets and so on. As a result of this, I'd feel confident in saying that none of you have been paying any attention to the flamboyant footwear on show in Russia this summer. Of course you haven't, the World Cup is on. Why w​ould you be staring at the boots? The Egyptian star had to sit out his country's first World Cup game in 28 years after damaging his shoulder in Liverpool's Champions League final loss against Real Madrid. However, in the two games that he did manage to play in, he bagged one goal in each whilst wearing a customised edition of the new adidas X range. The custom print on the top of the boot is there to symbolise the hopes of 100 million Egyptians whose hopes rested on Salah's shoulders. The Real Madrid and Germany star has convinced Adidas to continue making the discontinued Adipure 11Pro boots just for him, and has now worn them at the 2014 and 2018 World Cup. The Liverpool academy graduate made his England debut whilst wearing the black/silver colourway of the Under Armour Magnetico, but couldn't help the Three Lions to victory over Belgium in them. He is the only player in the England squad to wear Under Armour boots. Jerome Boateng decided to embark on this summer's tournament in Russia with a flashy addition to his Nike Tiempos. The German replaced the normal laces with orange and purple ones, for reasons only he will know, but they failed to aid his performances as he finished bottom of the group with Germany. After Nike cut off their supply deal in line with Donald Trump's US trade sanctions, the Iran players were forced to source their own boots for the World Cup. Ramin Rezaeian, in this case, remained in the pink Vapor X, unable to get his hands on the latest 'Just Do It' pack. Even the referees got in on the act in terms of classy boots this summer. All of the officials were supplied with blacked out adidas Copa Mundials, with FIFA World Cup branding. Very smart. The Liverpool and Senegal forward has recently moved out of his Nike Mercurial boots and slipped into a pair of New Balance, in line with the Reds' kit suppliers. He is one of a handful of players wearing the boot, and it must be said, they look pretty clean. Edison Flores is a fashionable guy. Along with being lucky enough to wear that gorgeous Peru kit, Flores matched the kit made by Umbro with a similar colourway in boot form. The Belgium stuck with his trusty adidas ACE boots as his country recorded their highest ever World Cup finish. Kompany has complained to the sportswear giants in the past for their decision to stop making leather versions of their boots; his leather ACE boots are the only ones of their kind on show at the World Cup. 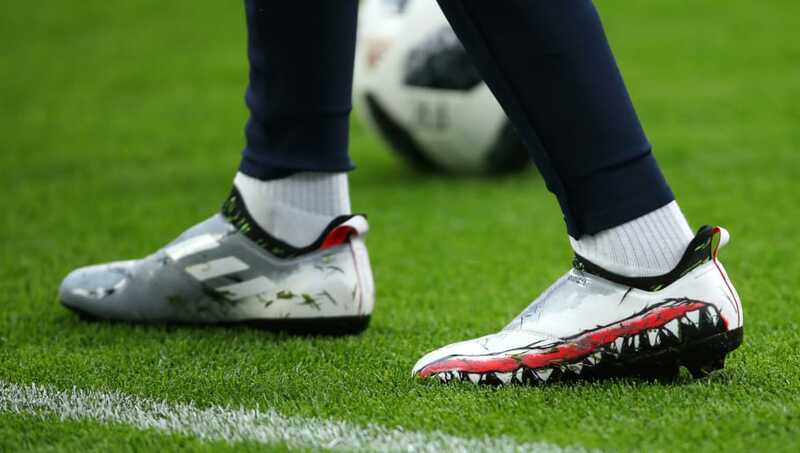 In line with his 'Shark Team' tagline in relation to Manchester City's dominance during the domestic season, Benjamin Mendy took to the World Cup with a custom 'shark' version of the adidas Glitch boot. After playing just 401 minutes all season, Mendy ends his campaign with a Premier League and World Cup winners' medal to show for an injury hit year. Arguably Russia's star man this summer, Aleksandr Golovin opted against slipping into Nike's latest 'Just Do It' pack, instead remaining with the silver Vapor X. The hosts made it to the quarter finals, and Golovin's performances attracted a lot of attention; purely down to the boots, obviously. Argentina look infinitely better when Banega started, not just because of his calming influence in midfield, but in terms of fashion as well. Banega wore a blackout version of the latest Mercurial Vapor 360, adorning his number '7' just above the laces. Very classy. Adidas hooked their poster boy up with a fresh green version of Nemeziz 'Messi' boots to wear on the World's biggest stage. Despite that, Messi still failed to light up the World Cup, exiting at the round of 16 stage in what may have been his last ever appearance at the tournament. Brazil's boy wonder began wearing the limited edition 'Meu Jogo' boots made specially for him at the round of 16 stage. Neymar needed just 51 minutes to christen the boots with a goal against Mexico, but only got one more run out in them after the Selecao's quarter final defeat to Belgium. Cristiano Ronaldo - Mercurial Superfly CR7 Chapter 6 "Edição Especial"
Nike's most marketable footballer lit up the group stages with a stunning hattrick against Spain in what was arguably the game of the tournament. CR7 took to the field wearing a limited edition of his Mercurial Superflys for his country's Round of 16 tie against Uruguay, but failed to deliver as he was sent home by Edinson Cavani's heroics.